WASHINGTON — The earliest known winery has been uncovered in a cave in the mountains of Armenia. Such large-scale wine production implies that the Eurasian grape had already been domesticated, said McGovern, author of "Uncorking the Past: The Quest for Wine, Beer and Other Alcoholic Beverages." The same Armenian area was the site of the discovery of the oldest known leather shoe, dated to about 5,500 years ago. That discovery at the area known as Areni-1 was reported last summer. According to the archeologists, inside the cave was a shallow basin about 3 feet across that was positioned to drain into a deep vat. The basin could have served as a wine press where people stomped the grapes with their feet, a method Areshian noted was traditional for centuries. They also found grape seeds, remains of pressed grapes and dozens of dried vines. The seeds were from the same type of grapes – Vitis vinifera vinifera – still used to make wine. The earliest comparable remains were found in the tomb of the ancient Egyptian king Scorpion I, dating to around 5,100 years ago. 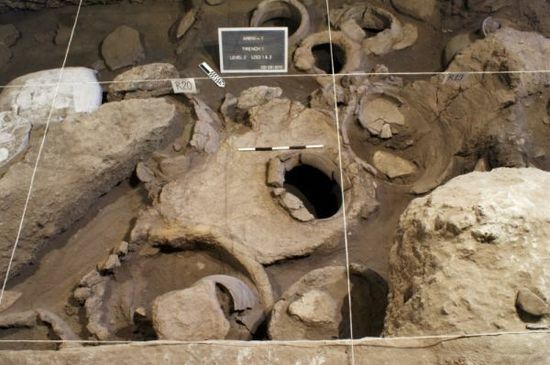 Because the wine-making facility was found surrounded by graves, the researchers suggest the wine may have been intended for ceremonial use. That made sense to McGovern, who noted that wine was the main beverage at funeral feasts and was later used for tomb offerings. Indeed, he said, "Even in lowland regions like ancient Egypt where beer reigned supreme, special wines from the Nile Delta were required as funerary offerings and huge quantities of wine were consumed at major royal and religious festivals." McGovern noted that similar vats for treading on grapes and jars for storage have been found around the Mediterranean area. In his books, McGovern has suggested that a "wine culture," including the domestication of the Eurasian grape, was first consolidated in the mountainous regions around Armenia before moving to the south.